I arrived at the Allegheny Arms & Armor Museum just before 10am on a day they were scheduled to be open in June of 2010 according to their website at the time. No one came to open the museum building at the scheduled 10am opening, and no one showed up while I was there until almost noon. All of the outdoor exhibits were neglected and some were very overgrown by tall grass. Be prepared for your shoes & pants legs to get wet from the tall grass if you go in the morning. There was a bees nest in the Sikorsky Helicopter which I had to watch out for. The museum appeared to have been closed for some time and I had to stop and ask directions from several locals until I found someone who knew where it was. 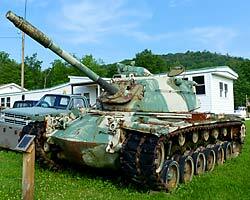 The Allegheny Arms & Armor Museum does have a couple of rare items that I had not seen before. The Soviet T-62 Main Battle Tank was unusual (Soviet T-72s are more common in US Military Museums) and the LVTP7 Armored Amphibious Assault Vehicle was the first I had seen in a museum (they are still in active service by the US Marine Corps). The M48 Patton Tank is in fair shape and appears to be missing its muzzle brake. The M42 Duster Self Propelled AA gun appears complete, but has suffered from the elements. 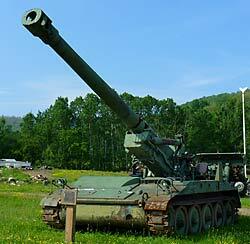 The M110 Self Propelled Howitzer with its big 8 inch gun is very impressive even in its current condition. 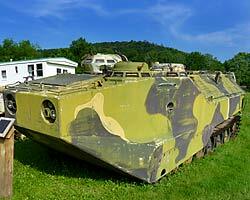 The Soviet BMP1 Amphibious Infantry Assault Vehicle is not that rare, but they are very unlike anything you'll see in the US military inventory. 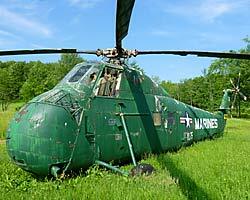 Along with the tanks and armored vehicles are a Sikorsky Helicopter and a Grumman A6 Intruder, both of which are in very poor shape. The exhibit in the best condition (and also the most unlikely) has to be the Coast Guard Motor Lifeboat. 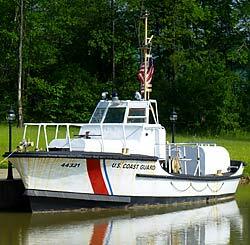 It is a 44 foot Motor Lifeboat living in its own pond. 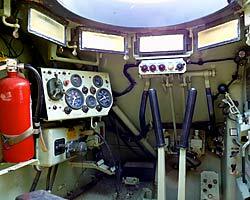 From the looks of the interior of the engine room it appears that it is in running condition. 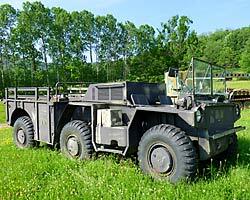 One more exhibit in good condition is the Daimler Ferret Armored Car, which looks like it may be roadworthy and is kept under cover. I don' t know what the story is with the closure of this museum. It looks like they got off to a good start and have amassed a respectable collection of armored vehicles and tanks and a fair amount of work went into the construction of the pond for the Coast Guard Motor Lifeboat. Two of the locals said it had closed a while back. 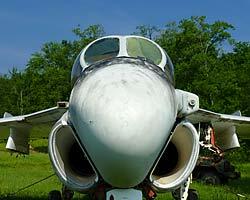 Several people were trying to direct me to another military museum a few miles away, the Eldridge WWII Museum. I did pay them a visit after leaving Allegheny Arms & Armor Museum and was pleasantly surprised. The Eldrdge museum is a gem. Their staff did confirm that AAAM had closed a while back, but could give no other details. I hope the exhibits at this museum find their way to other museums that will restore and display them properly. There are no restrooms or other open facilities at this museum, and no open indoor exhibits. The grounds are not exactly handicap accessible and there is no food available for several miles. 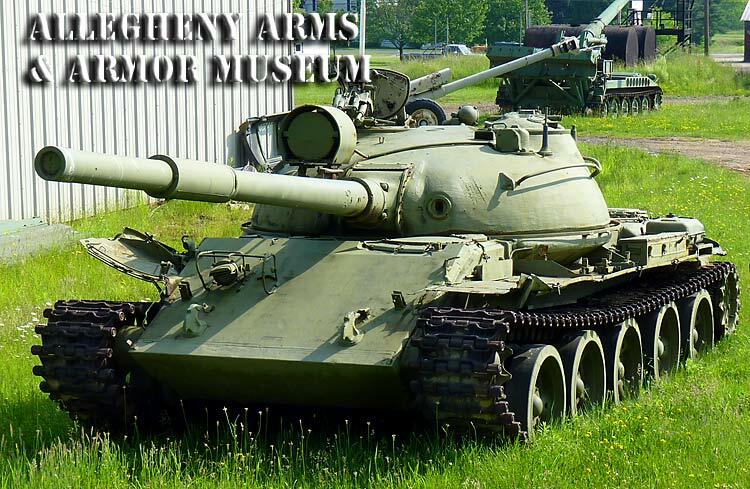 Visit the Allegheny Arms & Armor Museum Website for more information. This website is not affiliated with the Allegheny Arms & Armor Museum.